Like we always say: when updating old properties, you can't go wrong with throwback references. Stranded behind Cobra lines after a sneak-and-peek mission, Switch Gears put on his Cobra disguise, hot-wired a Cobra Hiss IV tank and almost made it back to friendly territory when Cobra Commander spotted his relentless drive towards GIJoe lines and rewarded him by making Switch Gears his personal driver. So, how do you guarantee the sales of a figure that no one is likely to want? Bundle it in with a figure that no one in their right mind would pass up. Switch Gears can handle anything that has tracks and bogie wheels, especially if it comes equipped with reactive armor and lots of offensive hardware. His favorite trick is to stroll into a fortified Cobra position posing as a courier with forged orders to retreat. Although he is a qualified expert with assault rifle and heavy machine gun, Switch Gears would just as soon go one-on-one with any Cobra with his bare knuckles. The concept of giving up is totally alien to him. Okay, saying that no one would want Switch Gears is a bit harsh - he's going to get more fans than, say, Grunt, for example - but I don't think anyone is buying this set specifically for the tank driver. Switch Gears reminds a bit of the Battle Force 2000 guys, though not as lame. He's wearing a green vest, white shirt and tan pants. 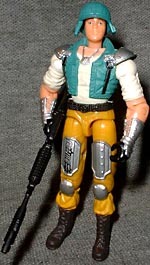 He includes a green helmet that looks really nice, and kitbashed machine gun/shotgun. 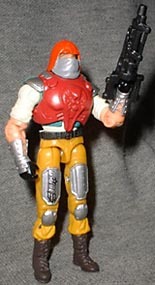 Hasbro was smart enough to give Switchy the SpyTroops gear in this set, to give him a more redeeming value. Disguised (sort of) as B.A.T. commander Over Kill, Switch Gears comes with a facemask, chest armor and a gun that fits over his hand. Unfortunately for his disguise, the gun goes on the wrong arm. The helmet doesn't really fit down on the figure's head very well, because the chest armor pushes it up slightly. Still, he does bear a resemblance to his intended target, even if it's not a particularly close one. Switch Gears has the look of a figure cobbled together from remolded pieces. The metal plates on his legs look familiar, and while his entire upper arm is sculpted to look like cloth, the paint of his shirt only extends down to the bicep joint, leaving him with some damn wrinkly skin. The supreme leader of all Cobra legions, is convinced that it is his destiny to rule the world with an iron hand! He stands at the very center of his own universe, smugly congratulating himself on his use of greed and fear to achieve his terrible aims. Ruthless and unimaginative, self-involved and unrepentant, vengeful and unforgiving, he combines the worst traits of humanity with the moral rectitude of a corporate executive, the honesty of a politician and the compassion of an HMO administrator. If Switch Gears is the figure nobody wants, then Cobra Commander is the one everyone has been waiting for. Though we did get a Cobra Commander in the very first series of this new Joe line, the figure was plagued by all the maladies of those early figures: a horribly disproportionate sculpt, oversized weapons and bad articulation. All that has been fixed now, and we've got one sweet toy. 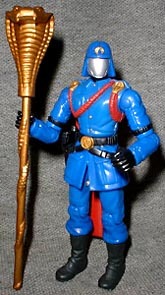 The first CC was wearing his blue hood, which didn't really make sense as part of a two-pack: Cobra Commander's hood is largely for ceremonial occasions, while his mirrored faceplate was more suited to battlefield conditions. The mask is more detailed now than in its original incarnation, but it's still obviously the silver visor we all remember. Cobra Commander is no longer as huge and bulky as the first release in this line - always a scrawny guy, CC didn't look right as a big beefhead, so it's good to see he's trimmed down to his fighting weight. His "battlefield command uniform," actually an artfully disguised suit of high-tech armor, is quite nice, really looking like a military dress uniform. Even the figure's weapons are an improvement - Hasbro has finally given up on those asinine "Sound Attack" tabs on the weapons, leaving us with some nice sculpts for the Commander's machine guns and snake staff. Sadly, the holster on his hip is the wrong size for any of the included weapons, though it does perfectly fit the pistols included with some other figures. 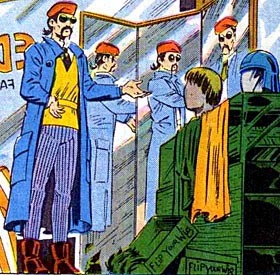 Cobra Commander has had a lot of costumes over the years, but this one might be the best. Luckily, the figure included with him is pretty good, as well. What's your favorite version of Cobra Commander? Tell us on our message board, The Loafing Lounge.